With the constant stream of brutal killings in the various Syrian cities and the absence of any of the world peace bodies capable of stopping this blatant Syrian Government murder I feel compelled once again to call on the forceful removal of this Butcher of his own people and pray to god that this creep will meet the same faith as Gaddaffi, the once proud master of Libya .Monsters like Assad will be brought to justice and the United Nations must now enforce the international rule of law. This is not the middle ages where the world was oblivious to the crimes of so called leaders. The Peoples of the world demand action now and the protection of the innocent. The last slide is of a little girl holding a placard for help ,she was brutally murdered just one day after this photo.All decent people must take a good look at this little girl face and ask themselves “have I done enough to stop her murder” and many more that might come to some other child what if she was your child??? ????? This innocent little girl is Martyred by the forces of Bassar al-Asad, some days ago. She was killed just one day after she was holding that board. The board says to help the Syrian children (especially in Homs). The armed forces of Syria are targeting children and killing them. his henchmen! The kid gloves are off this murdering madman must be dealt with. Sooner or later the people will rise in their masses and rid themselves of these murders of innocence . in Syria. 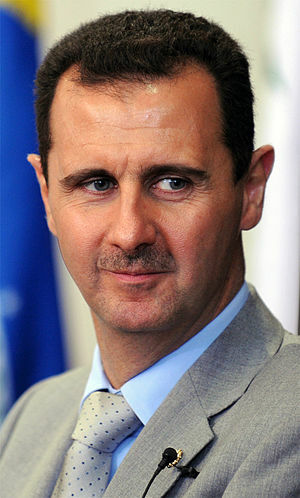 Bashar al-Assad would do well to consider his position very carefully .The people of Syria want their freedom now . to this great country soon and perhaps send a posting from there! Why not a close up on democracy in action! In any case congratulations to the free people of Libya .What ever happened to Iman al-Obeidi the lady from Benghazi who was raped by the henchman of Gaddafi I hope these thugs will now be arrested and brought to trial. the murder of their own citizens :Assad must go now! Western intelligence openly active in supporting and directing “rebel” forces in Libya. Clearly, Assad is unlikely to resign from power, which creates the ideal media conflict between him and his western detractors. Predictably, and once again, in this situation President Barack Obama‘s calls for sanctions against Syria and for its leader President Assad to “step down” from power are all part of a PR and diplomatic process designed to soften the ground for an impending NATO, or “coalition” group military intervention in Syria. No one can deny the strategic importance of Syria on the grand chessboard. It’s bordering neighbors include no less than Israel, Turkey, Lebanon and most importantly now, Iraq. It is also a natural political ally of Iran and aligned firmly with the region’s last remaining independent militia, Hezbollah. To bring Syria under the globalist umbrella would be a key jewel on the globalist crown in their effort to control the entire Middle East and Central Asian region. In addition, Syria is one the region’s most economically independent sovereign states and possesses an incredible basket of natural resources. For all these reasons, Syria is a very high priority for globalist economic privatisation and dismantling of the state that is currently in place. Israel’s stake in Syrian regime change is first and foremost- land. The Golan Heights, as well as its formerly occupied prize in the form of South Lebanon will be firmly within Israel’s grasp if the country should eventually come under US and European globalist control. Unlike Saddam Hussein in Iraq, or Gaddafi in Libya, President Assad’s confidence in Syria’s ability to overcome the current western-backed coup is not misplaced optimism. Unlike other soft targets in the surrounding region, Syria maintains one of the largest, most loyal, and well-trained standing armies and air force operations in the region. They have state-of-the-art anti-aircraft defense systems in place, and a very sophisticated and well-oiled intelligence network, one which has given its near neighbor and traditional adversary, Israel, a very difficult time penetrating over the decades. and their standards of living take a turn for the better. Choose your new leaders wisely.